I will have to admit I wasn’t the biggest fan of Santiago. Chase loved it, and truly appreciated the vibe, art, and feeling of the city. 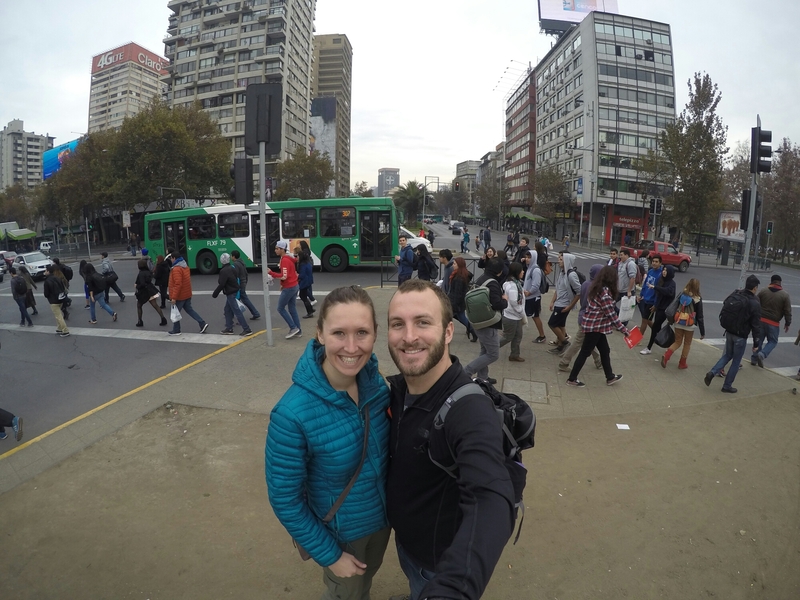 Maybe I compared it too much to other cities, maybe I had too high of expectations, but Chase and I had two different viewpoints on Santiago. Now, even though I wasn’t a huge fan, that does not mean I didn’t have a great time… Oh boy, was Santiago a fun ride! Here are the highlights of our escapades in Chile’s bustling capital. Chase and I didn’t have a hostel when we first arrived, and the one our friends from the bus went to was fully booked. So, we happened upon a different hostel in the university area of town. As it turns out, it was the largest hostel in all of Chile! There were tons of people there, large dorm rooms, and a great breakfast. It turned out to be a great fit. While it had ups and downs due to complete lack of organization by the workers, it was a great atmosphere. If you ever travel to Santiago, a great part of town to stay in is Provedencia. 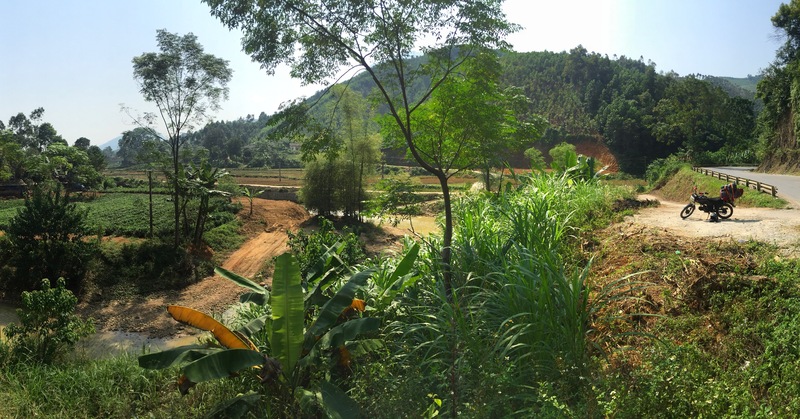 It is a quick metro ride or bike ride downtown to all of the main attractions, yet it is located in the university part of town, and filled with young adults in their 20’s that are social and welcoming. Obviously, that is a crowd that you either love or you hate; As Chase and I travel, it’s one we have grown to love. The friends we made the first night were the friends we stayed with through most of our stay in Santiago. As we first toured the hostel, a group of people instantly greeted us and invited us to join the festivities. The festivities turned in to dinner and more cocktails and then a nightclub. The nightlife in Santiago is absolutely vibrant! As we walked to the nightclub, there were people EVERYWHERE! We had free wristbands from the hostel, so we got to skip the 50-person line to enter and dance the night away. Many clubs and bars in Santiago do promotions that include free entry for foreigners and happy hours of free drinks for foreigners as well. We met so many people, and had a heck of a night with everyone. It was a great introduction to the people of Santiago. In the smog, there isn’t as much of a view. The Santiago skyline stretches on forever! That made the entire crowd bust up laughing again, this time at his shock. He said good bye and continued his jokes again, but not referring to us in any way. As it turns out, making fun of foreigners isn’t as funny when they understand the language. While it was amusing to Chase and me, he looked pretty embarrassed. The second two groups of people were both religious groups. As we approached I realized that it was actually one very spread out group. The carried giant signs and stood around each other, listening to the pastor talk about God. Passing people would stop or keep going, but the entire group was a peaceful setting. I never heard a single shout as we walked by. It was a sharp contrast to what a person would usually expect from a large gathering of people in a plaza. The opposite end of the plaza is where we first rented the bikes. We started a tour marked on one of our maps, but soon got lost. The map was far simpler than the actual city of Santiago and we soon figured out that just biking around proved to be a far easier place to familiarize ourselves with the city. We happened to rent bikes next to the tallest building in Santiago, so we used that as our landmark to get home and have a point of reference when going places. Aside from the statues and fountains, there was much to be seen! There are parks everywhere. While I know this is common in a lot of cities, I was still amazed at how clean they were! The parks were nicely groomed, there was no trash, and the benches and trees created an environment that welcomed everyone! There are parks, and then there are the parks you see in movies. Yes, the ones that all types of people sit at, walk through, and hang out in like a happy little family. Santiago has those parks. It brought a smile to my face to see the variety of people all going about their day in such harmony. The parks were little quiet spots of peace in an otherwise bustling city. My favorite part of Santaigo was on our last day there. We went to hike to the top of Cerro San Cristobal, but I saw a sign to the right that said “ZOO”. That was the turning point in our plans for the day! Luckily for us, the zoo is on the hillside. 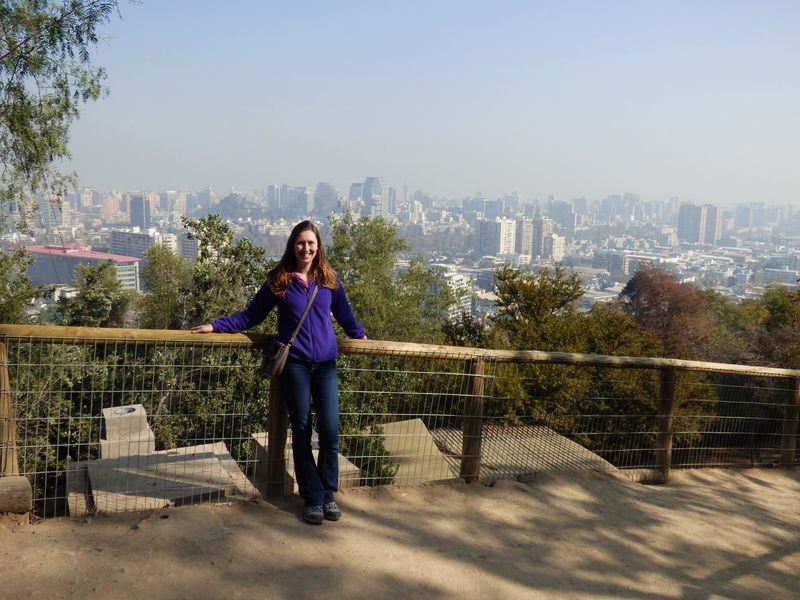 So, we got to hike Cerro San Cristobal and see the zoo animals at the same time! Now, to say I am a huge fan of the zoo is a huge understatement. I love zoos. LOVE!!! When we arrived at the zoo, things got even better! Since Santiago is the capital of Chile, it is also home to the Chilean National Zoo. This means we got to see all of the most awesome animals, all in one day! We started with the elephants and giraffes, which are also some of my favorites. Then, when I told the zebras to say cheese, they SMILED at me!!! When we passed the tiger cages, Chase and many other visitors tried to take pictures too close to the cage. When this happened, the tiger threw itself against the fence and roared! I watched 3 women scream, 2 men jump back and trip, and Chase almost throw the GoPro over his head! To say the least, it was an incredible day climbing a mountain and seeing all of the world’s animals along the way. 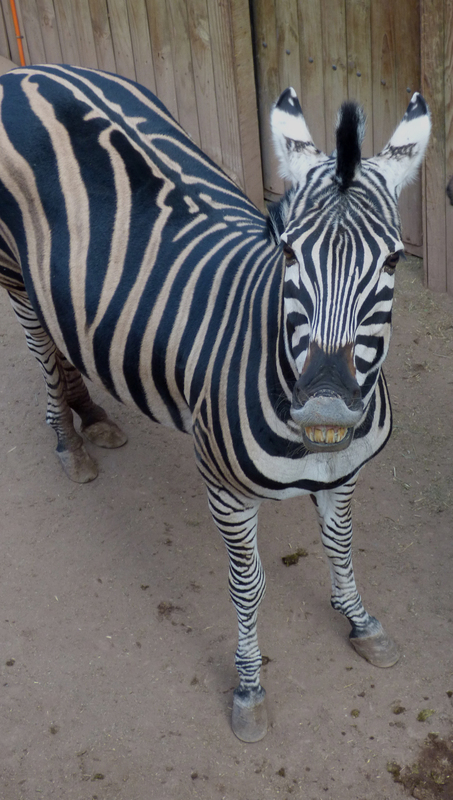 When I say cheese, the zebras all smile for me! Aside from the smog, Santiago is a pretty cool place. If you ever get the chance to visit, don’t miss out on renting a bike, going to museums, and enjoying your lunch in the park. There’s a ton to do in Santiago, but there is also a lot to take in and relax with. Tonight, as I write this, Chase and I are back in Santiago for one night before we head to Mendoza tomorrow morning. We switched hostels to somewhere quiet since all we need is some rest. Good choice for us! Off to bed, and I already miss listening to the ocean from our window in La Serena. However, I am thrilled to finally get back to the mountains, drink wine through Mendoza, and finally see Las Leñas in person!